After an early breakfast, my cousin had arranged for his car and driver to take us around the city. The driver (Linga Raj) was given a detailed list of places to bring us. We started by visiting a few of the nearby temples: the Ganapati Devasthan, the impressive Nandi (Bull) Devasthan and the Shiva Devasthan. I loved the temples but hated the priests, at the Nandi and Shiva Temples. As we prayed, the priests stood in front of us with the aarti. Even after partaking the aarti&apos;s grace, the priests continued to stand in front of us, hoping we will put money on their plate. I intentionally side-stepped and put a tiny donation in the Hundi. 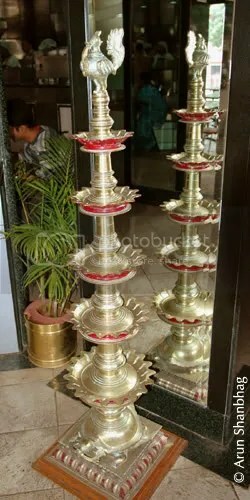 NB: Money on the plate goes to the priest as additional tips; money in the Hundi (safe box on the floor) goes to the temple, and is used for all temple activities, including priest&apos;s salary. For a second round of breakfast, we stopped at Kamat&apos;s Bugle Rock Cafe. Newly opened, very modern and very posh. This divli was well crafted and stood at the entrance of the restaurant. I wouldn&apos;t mind having this in my home. A list of places we visited, in sequence. The ancient Kote Venkateshwara Swamy Devasthan, and next door, Tipu Sultan&apos;s Summer Palace. 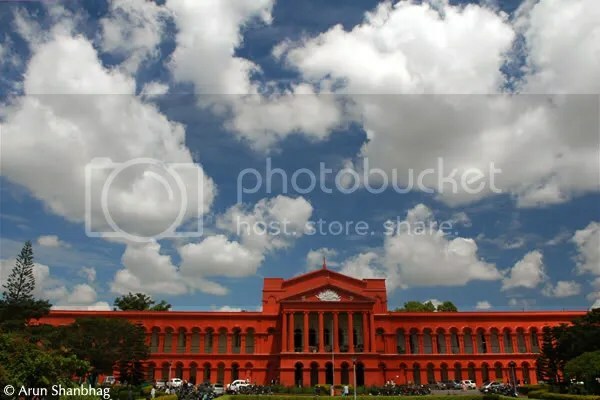 ISKCON (Hare Krishna) temple; Chitrakala Parikshad; Vidhan Soudha and the High court; We took a lunch break at Kamat&apos;s Yatri Nivas in Gandhinagar – read more here) and a short nap. After a refreshing Kapi, we drove around MG Road; Ulsoor (sp?) Lake; window-shopped on Commercial St and bowed our heads in awe at the magnificent Someshwara Temple, Visroor. Our amazement continued at the temple of modern capitalism: The uber-posh Forum Mall with India&apos;s first Apple store. 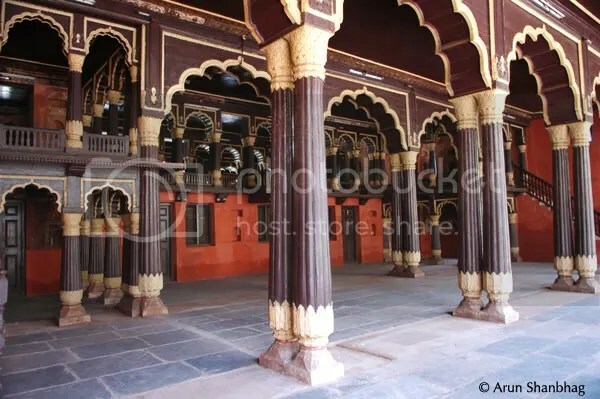 Tipu Sultan&apos;s Summer Palace. An interesting building and very well maintained. On the back (or front) side, there is a similar appearing courtyard with pillars; perhaps this was designed as a building with two identical faces? ISKCON&apos;s Hare Krishna Temple. 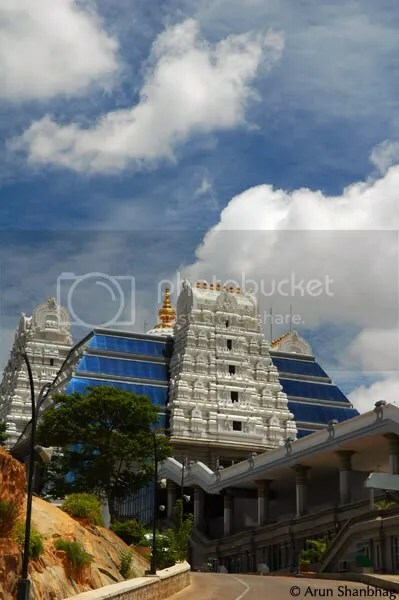 This is a beautifully constructed new temple. The grounds are very tastefully done. To enter the main temple hall, visitors are corralled through a series of raised tiles. As you step on each tile you have to recite “Hare Krishna Hare Krishna Krishna Krishna Hare Hare,” along with a person chanting the mantra on the speakers. The main temple hall is impressive as well. But once you are past the exquisitely carved murthy of Radha and Krishna, there is a lot of commercialization. They sell books, crafts, posters and a wider variety of foods. Apparently they feed about a 100,000 thousand needy students in the Bangalore area. It&apos;s a well oiled machine, and with the help of many volunteers, this only costs them about 600,000 Indian Rupees per month. Approximately 6 rupees to feed one student for a month! 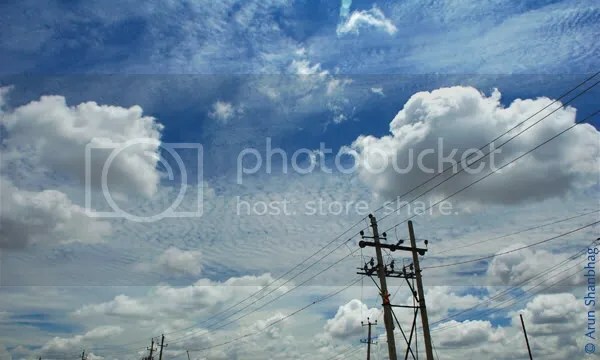 Blue Sky across from the Temple. So spectacular, I had to stop the car and take the pic! Chitrakala Parishad. 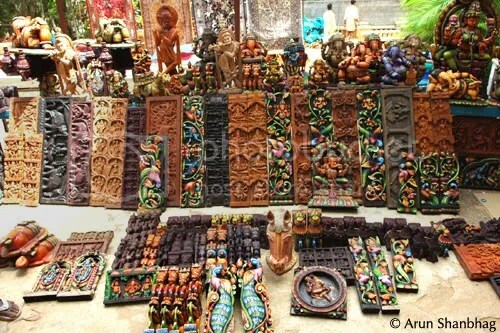 Organization for promoting handicrafts. On the grounds, several artists sell a variety of crafts. Everything here appeared very well made and very inexpensive. All this would have made excellent gifts for my friends here, but they will have to make do with pics instead. There was also a large hall on the grounds, and there must have been about 50 vendors selling all kinds of handmade jewelery, dresses, floral patterned skirts, embroidered bedsheets. All very nice! 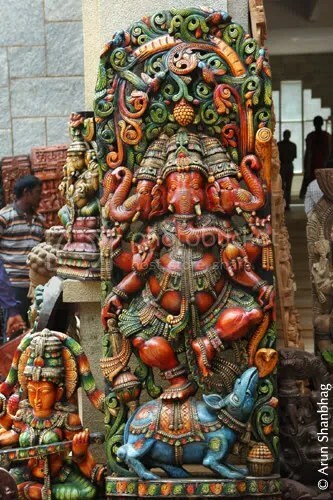 This larger than life sized carving of Ganesh was for sale as well. !!! 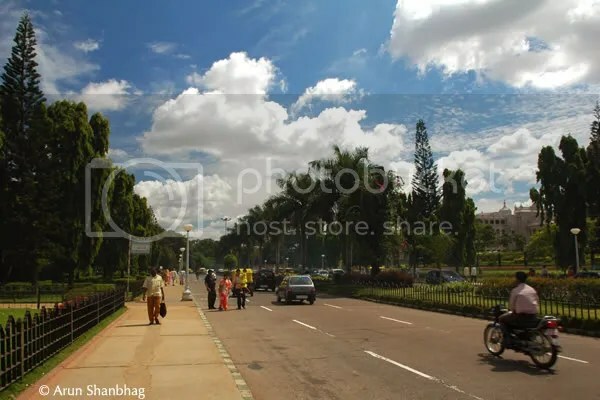 Promenade across from the Vidhan Soudha. I thought this pic had overtones of Monet&apos;s Promenade at Argenteuil. 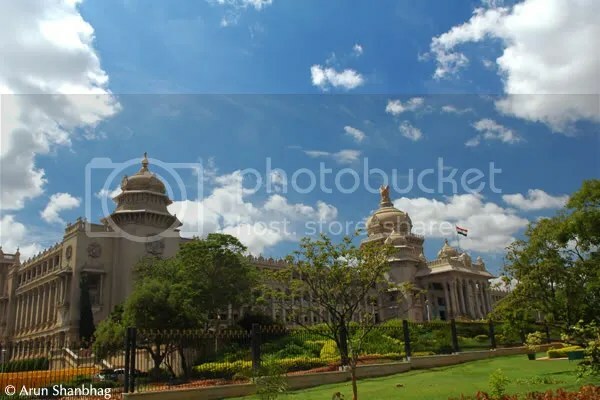 The impressive Vidhan Soudha – Karnataka State&apos;s Parliament! and the High Court, across the promenade! 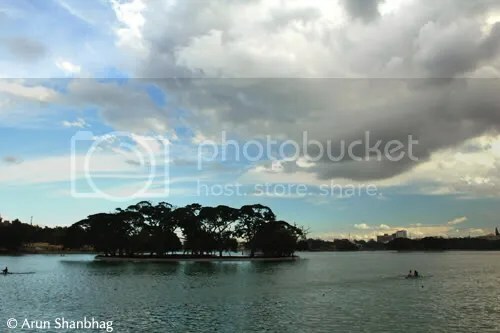 The serene Ulsoor (or Halasoor ?) Lake: Newly renovated, it includes a walking/running trail around the entire lake. Lots of folks relaxing after a long day. Near the entrance, there are several smaller water bodies with fountains etc. Very nice! Saw a lot of rowers on the water. After walking around the crowded Commercial Street, the driver pointed to a narrow alley and directed us to the Someshwar Devasthan. I was surprised to find this important Shaiva temple tucked the midst of a buzzing bazar. At the temple, I was impressed by the large number of statuettes in the antaralaya (area adjacent to the main sanctuary, where we circumambulate the deity). These statues about 8 – 10 inches tall in black stone, had been meticulously clothed and decorated with a sindhoor and chandan tilak. 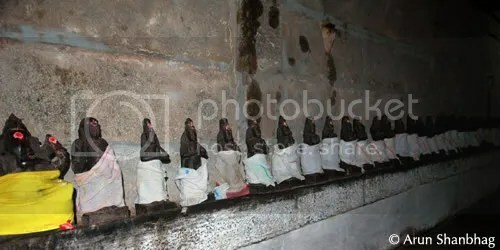 On asking, the priest explained that the 63 statuettes represented the 63 Nayanars. These saints set an example for the Shaiva faith, by their lavish poetry and unstinting devotion to God. They came from varied backgrounds (some royal, some laborers) but all dedicated their lives to the service of God, and are considered prime examples of bhakti devotion. The row starts with a tribute to Shri Ganesha, divinity of all knowledge. You can read more about the Nayanars here, and see here for a concise listing. I invite more knowledgeable readers to please share and enlighten us all on this important aspect of the Shaiva faith. 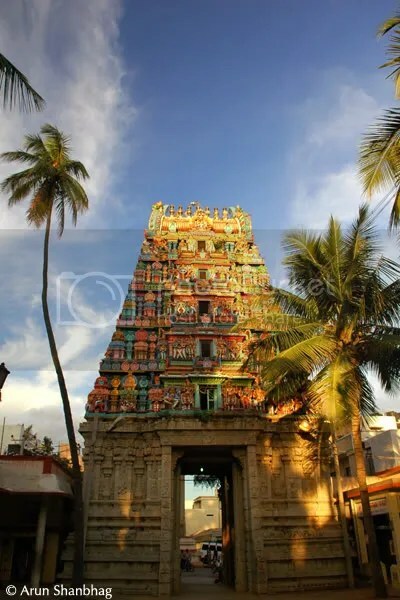 Having learn&apos;t of the Nayanars, I was elated and as we stepped out, we stared in amazement at the stunning image before us – the light of the setting sun had bathed the gopuram in an ethereal golden glow! I had to blink to realise that it was the natural light! I stood there admiring it for a few minutes, took a few pics, then reluctantly walked out into the commotion on the street outside. All in all, a great day, and a great city!